Visit Organize It online at Organize-It.com which was founded in 1997 as a design and installation business of custom closet systems. Organize It also started carrying innovative storage and organization products which customers could utilize in their closet, garage, and other areas throughout the home or office. Whatever your organization need, Organize-It.com is sure to please. Save on your next purchase from Organize-It.com with Organize It discounts, Organize It coupons and Organize It savings found here on 58Coupons.com. Enjoy $15 off your online spend of $125 or more at OrganizeIt.com. Click link to view code. 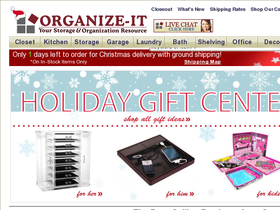 Shop online at Organize-It.com and you can save $12 on your purchase of $80 or more with this coupon code. Click link. Save 6% on your order of $80 or more from Organize It when you use this code at checkout. Click link and start shopping. Shop for storage products on OrganizeIt.com and you can save 10-15%. Organize your closet with Organize-It.com and you can save up to 40% off closet systems. Don't miss out on the Closeout section at OrganizeIt.com where you can find savings up to 75%.